Next time you ride, pay attention to your elbows, the area between your upper arm and forearm. There is one bone in your upper arm, the humerus, and two bones in the forearm, radius and ulna. These bones meet at the elbow. The point of your elbow is the upper end of the ulna. The elbow opens and closes like a hinge joint. Allow your right arm to hang by your side then contract your triceps (the muscle on the back of your arm). This opens or extends your elbow. Now close the elbow by flexing the biceps as much as possible; this brings your wrist to your shoulder. Good rider position is about halfway between. Photo 1. Correct elbow position. The elbows are slightly in front of the rider’s pelvis. Note that in a Western saddle this would be slightly in front of the horn. This helps to create an elastic feel on the reins. The horse also has elbow joints. To find your horse’s elbow, run your hand down the shoulder blade until you come to the point of the shoulder. This is where the leg appears to connect to the horse. 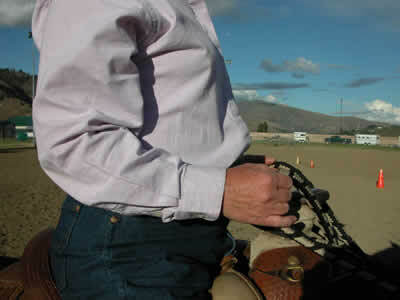 Then follow the upper arm back to the point of the elbow, which is just in front of the horse’s girth line. Notice that the horse’s elbow is very close to his body. The ulna forms the point of the horse’s elbow the same as your elbow. With a cooperative horse, pick up the front leg with one hand and your other hand free. Feel the point of the elbow as you lift the leg. As you place the foot back onto the ground, the elbow joint is opening or extending. Photo 2. The elbows are too straight. The hands are too far in front of the horn. The rider has thrown the contact away, abandoning the horse and potentially throwing herself and the horse off balance. A good, solid rider position for the elbow is just in front of the top of your pelvis. Obviously there is going to be some movement, but you want to avoid extremes, especially if your horse decides to pull on you. 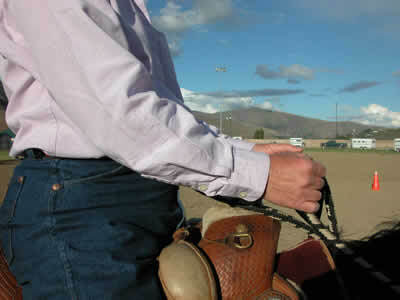 If your elbows get too straight they will be stiff and you could easily get pulled out of the saddle. Often riders with extended elbows tip forward, which puts the horse on the forehand. If you tend to throw your arms forward when moving off, you can knock the horse off balance. If your elbows are behind your back, there is nowhere else for your arms to go. 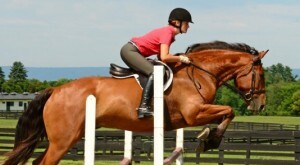 The next step will be bracing against your stirrups and leaning back. Pulling your elbows back means you are pulling on the horse’s mouth. Often this causes the horse to throw his head in the air. Photo 3. The elbows are too far back. 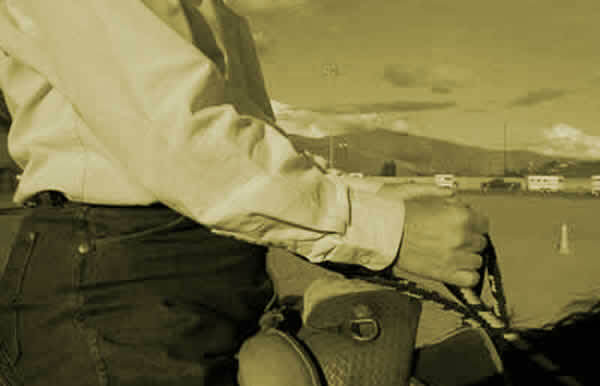 The rider’s hands are behind the saddle horn. The rider’s back has hollowed and stiffened. Keep your elbows in a good position by your sides. 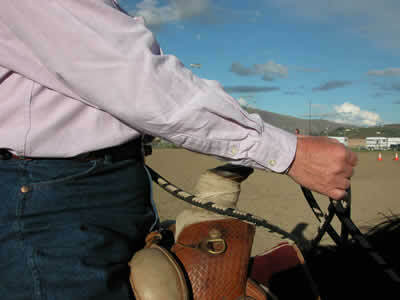 Only move your hands forward an inch or two to invite your horse to move forward, then return your elbows to your sides. 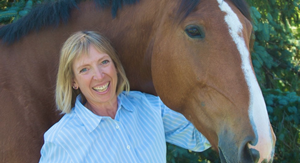 Allow the elbows to move a little as you follow the horse’s movement. Shorten your reins before you stop, thus keeping your elbows by your sides so that you can use your seat more effectively. 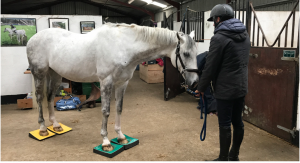 Use this Murdoch Minute as a ‘body position self-check’ before you begin to ask your horse to slow down, stop or go forward. Adjust you reins to your position instead of adjusting your position to the reins. And remember- enjoy the ride!